Background and objectives Urinary albumin excretion and/or albumin to creatinine ratio are associated with CKD and higher risk of cardiovascular events. Several studies investigated the effect of reduced dietary sodium intake on urinary albumin excretion and/or albumin to creatinine ratio in adult patient populations, but the majority was inconclusive because of insufficient statistical power. A meta-analysis of the randomized, controlled trials available could overcome this problem and lead to more definitive conclusions. Design, setting, participants, & measurements A systematic search of the online databases available (from 1996 to October of 2014) was conducted of randomized, controlled trials that expressed urinary albumin excretion or albumin to creatinine ratio as the difference between the effects of two different sodium intake regimens. For each study, the mean difference and 95% confidence intervals were pooled using a random effect model. Heterogeneity, publication bias, subgroup, and meta-regression analyses were performed. Results Eleven studies met the predefined inclusion criteria and provided 23 cohorts with 516 participants and 1–6 weeks of follow-up time. In the pooled analysis, an average reduction in sodium intake of 92 mmol/d was associated with a 32.1% (95% confidence interval, −44.3 to −18.8) reduction in urinary albumin excretion. The effect of sodium restriction was higher in the cohorts including patients on concomitant renin-angiotensin-aldosterone system–blocking therapy, in the studies with intervention lasting at least 2 weeks, and among participants with evidence of kidney damage. A greater reduction of urinary albumin excretion was associated with a higher decrease in BP during the intervention. The analysis of changes in albumin to creatinine ratio provided similar results. Conclusions This meta-analysis indicates that sodium intake reduction markedly reduces albumin excretion, more so during concomitant renin-angiotensin-aldosterone system–blocking therapy and among patients with kidney damage. The causal association between excess salt intake and high BP is well recognized (1), and recent meta-analyses of randomized, controlled trials have shown that moderate reduction of salt intake safely reduces BP in both hypertensive and normotensive individuals (2). A direct relationship between habitual salt intake and incidence of cardiovascular events, primarily stroke, has also been shown by meta-analyses of prospective studies (3,4). Hypertension and type 2 diabetes are the main culprits of the growing incidence of CKD in the adult population (5). In addition, robust experimental evidence argues for structural and functional alterations induced by high-salt regimens on the kidney above and beyond the effects of high BP and hyperglycemia (6–8), possibly caused by an abnormal response of the local renin-angiotensin system to high salt intake (9,10). Because urinary albumin excretion (UAE) and albumin to creatinine ratio (ACR) are expressions of renal functional damage and predictors of the decline in renal function over time (11), several clinical studies investigated the effects of sodium restriction with or without concomitant treatment with renin-angiotensin-aldosterone system (RAAS)–inhibiting drugs on UAE and/or ACR (12–14); statistically significant evidence of benefit from lower sodium intake was only seen, however, in a few studies, possibly because of the low statistical power of most of them. We, thus, performed a systematic review and a meta-analysis of the available randomized, controlled trials of sodium intake reduction and urinary protein excretion to test the hypothesis that dietary sodium reduction reduces albuminuria and evaluate its possible potentiating effect during RAAS inhibition. 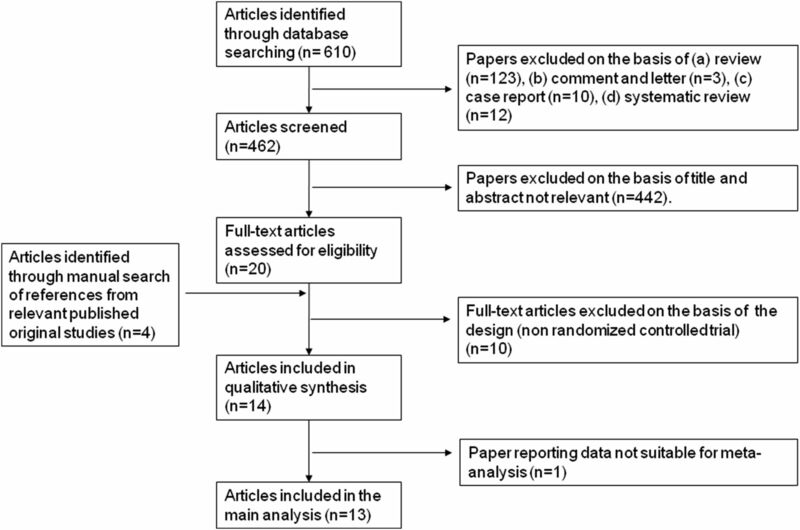 This meta-analysis was planned, conducted, and reported according to the “Preferred Reporting Items for Systematic Reviews and Meta-Analysis” statement (15) (Supplemental Table 1). We performed a systematic search for publications using MEDLINE (from 1966), EMBASE (from 1980), and the Cochrane Library through October of 2014. The search strategy without restrictions is reported in Supplemental Table 2. Additional information was retrieved through a manual search of references from recent reviews and relevant published original studies. L.D. and G.R. independently extracted the data. Discrepancies about inclusion of studies and interpretation of data were resolved in conference, and consensus was reached after discussion. To be included in the meta-analysis, a published study had to meet the following criteria: (1) original article, (2) adult population study, (3) randomized, controlled trial, (4) difference in UAE and/or ACR between two different sodium intake regimens in one or more patient cohorts, and (5) indication of the number of participants included in the exposed and control groups for each cohort. The main characteristics of the identified studies and the respective populations were recorded and reported in Table 1. Funding sources, if any, are reported in Supplemental Table 3. The risk of bias of the studies included in the meta-analysis was assessed according to established criteria (16) (Table 2). A detailed description of the statistical methods was reported previously (17). Where available, mean differences (MDs) and SEMs of the defined outcomes were extracted from the selected publications. If these were not available, MD and SEM were calculated from the comparison of the outcomes of low- and high-sodium regimens. Because of the heterogeneity among the studies in the formal expression of results (namely, albuminuria per 24 hours or albumin excretion rate), the between-regimen changes in UAE and ACR were used in the analyses after conversion to percentages when not already available. The pooled MD and 95% confidence interval (95% CI) were estimated using a random effect estimator on the basis of small sample adjustments (likelihood-based method) (18,19). Sensitivity analysis and estimate of heterogeneity were performed as previously described (17). Funnel plots were constructed and visually assessed for the presence of publication bias (20); in addition, Egger’s test was used to test for funnel plot asymmetry. Moreover, subgroup and meta-regression analyses were used to identify associations between changes in UAE and ACR and relevant study or patient characteristics as possible sources of heterogeneity. All statistical analyses were performed using the Stata Corp. software (version 11.1) (19) and the MIX software (version 1.7) (21). From a total of 610 publications retrieved, 14 articles met the inclusion criteria (12–14,22–32) (Figure 1). These corresponded to 12 studies, of which, in the studies by Houlihan et al. (12,28) and McMahon and colleagues (30,31), the effects of sodium restriction on UAE and ACR were reported in separate articles, and both were considered for the meta-analysis. Because one of 12 studies reported the outcomes in a way not suitable to our analytic approach (22), only 11 studies (corresponding to 13 articles) were included in this report (12–14,23–32). As shown in Table 1, the meta-analysis involved 516 men and women overall from four countries. The participants were healthy individuals, patients with hypertension, patients with type 1 or 2 diabetes, and/or patients with normo- or microalbuminuria, established proteinuria, or a combination thereof. Most studies provided multiple cohorts (for a total of 20), including different categories of patients (25–27) or patients on different pharmacologic treatments according to a parallel arm or cross-over design (12–14,28,29,32). Stepwise procedure for selection of the studies. Flowchart indicating the results of the systematic review with inclusions and exclusions. With respect to the comparison of the effects of higher versus lower sodium intake, all of the studies were randomized, controlled trials, and six of them adopted a cross-over design. Five studies were double-blinded with regard to the sodium regimen thanks to the use of slow sodium and identical placebo tablets, whereas in the remaining studies, sodium intake was changed through dietary modifications. In 11 cohorts, the participants were on concomitant RAAS-blocking treatment, whereas in the others, they received either placebo or no pharmacologic treatment at all. All of the studies used 24-hour urinary sodium excretion as a proxy for sodium intake during intervention. All of the studies reported UAE as an outcome, and seven of them also reported ACR. The length of intervention ranged from 1 to 6 weeks. The evaluation of the risk of bias level indicated that seven studies were at low risk of bias (14,23,24,27,29–32) and that four studies were at high risk of bias (12,13,25,26) (Table 2). External funding sources were declared in all but two studies (Supplemental Table 3). Detailed features of 11 studies included in this analysis are given in Tables 1 and 2 (13,14,22–25,27–30,32). In the pooled analysis of 23 cohorts, lower sodium intake (average weighted difference in 24-hour urinary sodium excretion =92 mmol or 5.4 g salt) was associated with lower average UAE (−32.1%; 95% CI, −44.3 to −18.8; P<0.01) compared with the higher sodium regimen. There was significant between-study heterogeneity (Q=104.0; P<0.01; I2=80%) (Figure 2). Visual analysis of the funnel plot indicated little asymmetry (Supplemental Figure 1), whereas Egger’s test did not find significant evidence of publication bias (P=0.20). Favorable effect of lower salt consumption on urinary albumin excretion (UAE). Forest plot of the effect of lower dietary salt intake on UAE in 23 population cohorts from 11 published studies. Results are expressed as mean differences and 95% confidence intervals (95% CIs). ACE, angiotensin-converting enzyme; HCT, hydrochlorothiazide; HDS, basal high–dietary salt intake; LDS, basal low–dietary salt intake; MALB, microalbuminuria. A trend toward a direct association between lower salt intake and reduction in UAE was detected in almost all of the cohorts included in the analysis (Figure 2), but it was statistically significant in only eight of them. Sensitivity analysis showed that the average change in UAE did not vary substantially with the exclusion of any individual study. The separate analysis of 11 cohorts including participants on concomitant RAAS–blocking therapy (12–14,29,32) showed a particularly strong reduction of UAE on dietary sodium restriction (MD, −41.9%; 95% CI, −56.4 to −27.4). There was again significant heterogeneity among studies (Q=68.6; P<0.01; I2=85%), but sensitivity analysis showed that the average fall in UAE did not change substantially with the exclusion of any individual study. However, pooled analysis of 11 cohorts without concomitant RAAS–blocking therapy also showed a significant but less striking decrease in UAE on sodium restriction (MD, −17.2%; 95% CI, −26.1 to −2.1) without evidence of study heterogeneity (Q=4.3; P=0.90; I2=0%). Subgroup analysis indicated that albuminuria was reduced significantly more in the cohorts including patients on RAAS-blocking therapy compared with the other cohorts (P for interaction =0.01) (Table 3). A significantly greater effect of reduced salt intake was seen in the studies with intervention lasting at least 2 weeks compared with those of only 1-week duration (Table 3), despite the fact that the degree of sodium restriction was much greater (212 mmol/d) in very short interventions than those of between 2 and 6 weeks in duration (79 mmol/d) (Table 1). Also noteworthy, despite the greater sodium intake reduction in the very short-term trials, the systolic BP changes observed in the course of intervention were higher with interventions lasting at least 2 weeks (averaging 7.2 mmHg) compared with those of only 1 week in duration (average 3.2 mmHg). The change in BP during the intervention was a significant source of heterogeneity (1 mmHg lower systolic or diastolic BP being associated with a decrease in UAE of 4.3% and 5.6%, respectively) (Table 4). 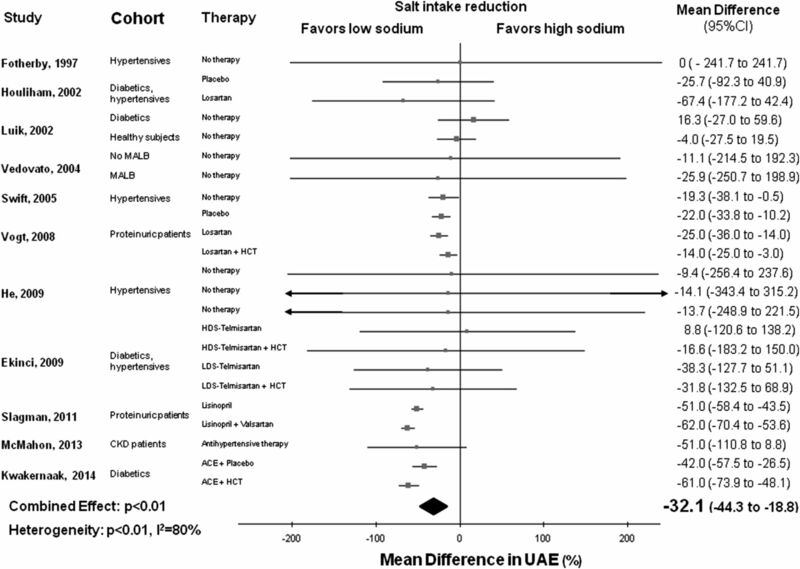 Larger effects of salt intake reduction on UAE were also observed in the cohorts including patients with evidence of kidney damage compared with those without these patients (Table 3). Accordingly, meta-regression analysis of the relationship between basal GFR and changes in UAE showed that lower basal GFR was associated with greater favorable effect of salt intake reduction (Table 4). The risk of bias level was a significant source of heterogeneity, with a greater effect of sodium restriction seen in the cohorts with low risk of bias compared with those with high risk of bias (Table 3). Larger sample size, more recent publication, higher percentage of men, older age, and higher body mass index (BMI) were all associated with greater reduction in UAE on dietary sodium restriction. On the contrary, hypertension or diabetic status, participants’ countries of origin, changes in GFR, type of randomized, controlled trial, and support by the pharmaceutical industry were not significant sources of heterogeneity (Tables 3 and 4). Finally, subgroup analysis of the studies using salt supplementation superimposed on a relatively low-sodium diet versus those using a dietary salt restriction protocol showed that there was a similarly beneficial effect of lower dietary sodium intake on UAE in the two types of study (Table 3). In total, seven studies with 14 cohorts and 381 total participants were included in the assessment of the association between sodium intake reduction and changes in ACR (13,24,27–29,31,32). In the pooled analysis of 14 cohorts, reduced salt intake (average between-group weighted difference in urinary sodium excretion =77 mmol/24 h or 4.5 g salt) was associated with significantly lower ACR (MD, −26.4; 95% CI, −36.9 to −15.8; P<0.01), with no significant heterogeneity between studies (Q=10.3; P=0.70; I2=0%) (Figure 3). The funnel plot for the effect of sodium restriction on ACR suggested no significant publication bias, which was confirmed by Egger’s test (P=0.80) (Supplemental Figure 2). 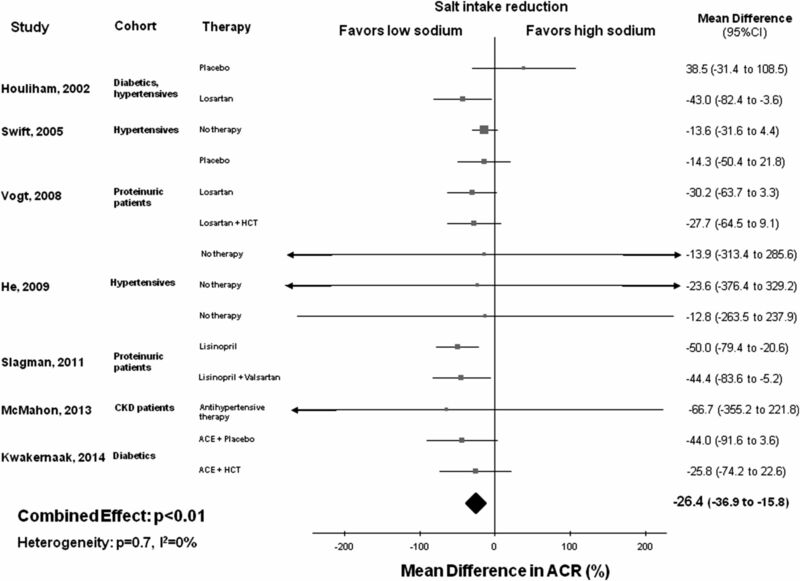 Sensitivity analysis indicated that the decrease in ACR with reduction of salt intake did not substantially differ with the exclusion of any individual study. Favorable effect of lower salt consumption on albumin to creatinine ratio (ACR). Forest plot of the effect of lower dietary salt intake on ACR in 14 population cohorts from seven published studies. Results are expressed as mean differences and 95% confidence intervals (95% CIs). ACE, angiotensin-converting enzyme; HCT, hydrochlorothiazide. This meta-analysis showed a direct association between reduction of dietary salt intake and decrease in UAE, regardless of whether it was expressed as absolute UAE or ACR. This finding was strengthened by the apparent lack of major publication bias and the observations of a decrease of at least 10% in UAE in almost all of the cohorts and a fall of 25% or more in 11 of 23 cohorts. A second major result was given by the evidence of an important potentiating effect of sodium restriction on the antialbuminuric effect of RAAS-inhibiting therapy. In this respect, our meta-analysis confirms the results of several previous investigations with different designs, suggesting a beneficial effect of sodium restriction on albuminuria when added to RAAS-blocking drug therapy (33–35). This finding notwithstanding, our review is supportive of a significant benefit associated with sodium restriction per se. In fact, antihypertensive drug treatment was not provided in 11 of the cohorts included in our study, but in these cohorts, a statistically significant and clinically relevant, albeit smaller, reduction of UAE was achieved (Table 3). This finding is all of the more significant, because this subgroup included four cohorts in which the intervention lasted only 1 week. The beneficial effect of salt reduction on albumin excretion was dependent, to some extent, on the preexistence of renal damage, whether indicated by the presence of proteinuria (13,29), microalbuminuria (24), or lower GFR (30,31). A positive association was detected between BMI and the effect of sodium restriction on UAE, namely a higher BMI being associated with higher UAE decrease, a finding in keeping with previous observations (36). Age was also associated with a greater effect of sodium restriction on UAE, a finding possibly related to deterioration of renal function with aging. Length of intervention and BP changes during the intervention were further identified as factors having a significant effect on the albuminuric response to sodium intake reduction. On the contrary, the presence of a hypertensive or diabetic condition was not associated with a greater renal response to sodium restriction, but it was actually impossible to dissect out the specific influence of these conditions from that of numerous confounding factors, such as concomitant renal dysfunction, RAAS-blocking therapy, length of intervention, and degree of sodium reduction (all possibly affecting the activation of the renin-angiotensin system and the concomitant fall in BP). Finally, the method whereby the difference in sodium intake was achieved in the different studies, whether through salt supplementation superimposed on a relatively low-sodium diet or using a dietary salt restriction protocol, was not a significant source of heterogeneity, with a similar beneficial effect of lower sodium intake being detected in both types of studies. Major strengths of our meta-analysis are (1) the inclusion of only randomized, controlled trials of sodium reduction, (2) the finding of a consistent trend to reduction of albuminuria on sodium intake restriction in all but the four cohorts with intervention lasting only 1 week, and (3) the biologically plausible correlations observed between the renal response to sodium intake reduction and such relevant factors as concomitant RAAS inhibitor treatment, length of intervention, preexisting renal dysfunction, age, BMI, and BP change on manipulation of sodium intake. A weakness of our study was its inability to rationally assess a possible association between the extent of salt intake reduction and the observed decrease in UAE. This was possibly because of the remarkable between-study heterogeneity with regard to length of intervention, RAAS-blocking therapy, level of salt intake, and percentage change in salt intake on intervention. These factors, all amenable to affecting the albuminuric response to sodium restriction, occurred in different combinations in the different studies. As an example, a drastic reduction in sodium intake (>200 mmol/d) was applied in two studies featuring a very short (1 week) intervention period and no concomitant RAAS–inhibiting therapy. In all of the four cohorts provided by these two studies, only minimal BP falls and inconsistent albuminuric responses were observed on sodium reduction, very likely because of (unmeasured) sharp increases in renin-angiotensin system activity. Actually, in the trials providing concomitant therapy with an angiotensin-converting enzyme (ACE) inhibitor or an angiotensin receptor blocking agent, more moderate reductions of salt intake were associated with the overall best results (12–14,29). Also, our study does not allow us to draw definitive conclusions about the long-term effects of sodium intake restriction on albuminuria. It is, nevertheless, important that greater reduction in albuminuria was observed in the studies featuring longer length of intervention and relatively moderate reduction of salt intake, two findings suggesting that the implementation of a long-term program of moderate and gradual reduction of salt intake can be effective in reducing albuminuria in regular clinical practice, more so when combined with RAAS-inhibiting therapy when indicated. Additional limitations were given by (1) the small sample size of most of the available studies, (2) the heterogeneity of the cohorts with regard to participants’ characteristics, and (3) the inclusion of four studies, providing, altogether, nine cohorts at high risk of bias. Our study had no specific potential to address the mechanisms of the effect of lower sodium intake on albuminuria. However, the strong correlation observed between the changes in BP and the changes in UAE during reduced sodium intervention suggests that the BP-lowering effect of sodium reduction may have played a major role. Several previous studies reported a trend toward hyperfiltration in response to high salt intake (37–39); inadequately suppressed activity of the renin-angiotensin system during high salt intake might be responsible for this unfavorable renal hemodynamic response (40). Indeed, in animal experimental studies, a high-sodium regimen was shown to increase the expression of angiotensin II type 1 receptors in the cardiovascular system (9) and increase the angiotensin II type 1 receptor density in the renal cortex (10), thus presumably increasing the activity of the local RAAS. Furthermore, high sodium intake was reported to increase the levels of vascular (41) and renal (42) ACEs, thereby counteracting the effect of ACE inhibition (41). In still another study, salt loading displayed a dose-dependent effect on glomerular dynamics and proteinuria (7). The finding in this meta-analysis of greater benefit from sodium restriction in the studies with concomitant RAAS–blocking treatment is in keeping with these reports. Finally, a recent cross-sectional study found that high–dietary salt intake was associated with both increased albuminuria and C-reactive protein in treated patients with hypertension (43), suggesting that inflammatory mechanisms might also be involved in the nephrotoxic effect of excess salt intake (44,45). The demonstration that reduction of sodium intake is associated with reduction of UAE has strong potential clinical implications with regard to both progression to ESRD and cardiovascular morbidity and mortality. In particular, the strong evidence that moderate sodium reduction potentiates the effect of RAAS inhibition on albuminuria provides a practical and very effective alternative to the use of RAAS-blocking combination therapy, which was not supported by the recent Ongoing Telmisartan Alone and in Combination with Ramipril Global Endpoint Trial (ONTARGET) (46,47), Veterans Affairs Nephropaty in Diabetes (VA NEPHRON-D) (48), and Aliskiren Trial in Type 2 Diabetes Using Cardiorenal Endpoints (ALTITUDE) (49) investigations and is no longer recommended for patients with hypertension and diabetes and/or nephropathy by the current European Society of Hypertension / European Society of Cardiology guidelines (50) and the Diabetic Kidney Disease Consensus Conference (51). Finally, in consideration of the high prevalence of resistant hypertension in patients with kidney disease and the favorable effect of sodium restriction on resistant hypertension (52), these results also support the indication of dietary sodium restriction in patients with resistant hypertension on RAAS-blocking treatment. P.S. is an unpaid member of World Action on Salt and Health (WASH), the scientific coordinator of the Interdisciplinary Working Group for Reduction of Salt Intake in Italy, and a member of the committee for the preparation of the Italian Nutritional Guidelines. The other authors do not disclose any conflicts of interest. No financial support was received. The results of this study were partly presented at the European Hypertension Society’s 23rd Congress in Milan, Italy as an oral presentation on June 15, 2013. This article contains supplemental material online at http://cjasn.asnjournals.org/lookup/suppl/doi:10.2215/CJN.09110914/-/DCSupplemental.